Anatomy comprises the microscopic and macroscopic structure of the body and constitutes the basis for understanding any medical context. The Institute of Veterinary Anatomy offers instruction in anatomy, histology and embryology. Accordingly, the education in veterinary anatomy aims at a solid knowledge base applying modern pedagogic concepts, such as virtual dissection and virtual microscopy. 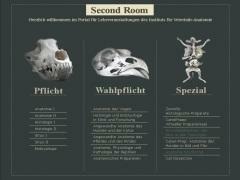 For the virtual courses, a particular virtual room, the so-called "second room" has been created. Besides the 'classical' morphological courses, applied anatomy courses with living animals and imaging techniques are offered. Research facilities of the institute comprise electron microscopy and a wide variety of morphometric, immunohistochemical, molecular biological and in vitro methods. A primary research focus is centred on establishing replacement methods for animal experiments. The institute offers service features for other research groups and is thoroughly integrated into the graduate school "Biology of Nutrition". AAdditionally, the institute harbours a unique collection of anatomical specimens, among them valuable historic exhibits such as the mounted skeleton of Condé, the favourite horse of Frederic the Great of Prussia. Veterinary anatomy, histology and embryology are taught for students of veterinary medicine (pre-clinical + clinical courses); additionally for related courses of the Berlin universities. Species considered are: dog, cat, pig, ruminants, horse, small pets, birds, and reptiles. Both, traditional methods and modern virtual techniques are applied. New teaching approaches such as "peer instructing" facilitate knowledge expansion and enhancement of "soft skills" for students. Teaching of anatomy comprises practical courses on animal dissection, applied anatomy with living animals, imaging techniques as well as a comprehensive range of plastinated and other anatomical specimens. For teaching of histology and embryology, a modern microscopy laboratory is available. All courses are supported by E-teaching and E-learning material.